New Delhi, 31st May (PTI): The issue facing CPI(M) in the wake of its worst electoral debacle is not that of leadership change but drawing "correct lessons" from it, senior party leader Sitaram Yechury said on Sunday. "No, that is not the issue. Let me put it very clearly, the issue in CPI(M) is not an issue of any leadership change. The issue is to come to a proper understanding of why this defeat took place and draw the correct lessons. That is the issue," he told PTI here. Asked if accountability, including of the top leadership would be fixed, Mr. Yechury responded by stating that the Central Committee meeting in Delhi from June 19 to 21 would discuss all these issues concerned and then decisions will be taken. When specifically asked whether somebody would take responsibility for the defeat when the party talks of collective responsibility, he said "that we will discuss." When pointed out that parties take shelter under collective responsibility so that heads did not roll and whether it applied to CPI(M) also, Mr. Yechury said "I cannot pre-empt my Central Committee's discussions. That is the problem. You will have to wait till the CC discussions." The Politburo member said there will be "very serious introspection" of the issue that led to the worst performance in West Bengal and Kerala since the party came into being in 1964 and the process has already begun. "All issues that are being raised will be reviewed. There will be nothing that will escape," the CPI(M) leader said when asked whether he thought party General Secretary Prakash Karat would have to quit against the backdrop of the reported feeling in West Bengal unit that he was obstinate on the issue of nuclear deal and withdrawal of support to the UPA government on the issue. Mr. Yechury said that as a concept the Third Front was not doomed. "Yes, it does," he said when asked as a concept whether the Third Front has a future. He said what was not credible and viable was the manner in which the Third Front was constituted before the Lok Sabha elections. He said the CPI(M) believed that in the future also a non-BJP, non-Congress political alternative that can bring about a progressive shift in the country's policies, was required. "It is not a cut-and-paste pre-electoral job. But it is something that will have to be forged through people's struggles. 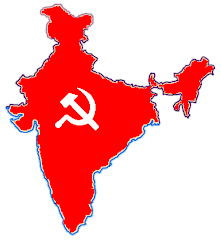 The CPI(M) is conscious of it that it will take time. "But in the meanwhile when elections come, we will align with some secular parties, but that alternative cannot be confused with an electoral front." Asked whether the CPI(M) and Karat made a miscalculation in cobbling up a Third Front, he said the issue will be discussed in the Central Committee meeting and he won't be able to comment anything before that. Maintaining that he was not blaming anybody for the failure of the Third Front, Mr. Yechury said that CPI(M) brought together state-level alliances into a national projection but the process itself, "it seems did not appear viable to the people. Number two, seeing L K Advani on the other side, people did not see a credible non-Congress secular alternative." He was asked about how the Left would oppose and stall measures like financial sector reforms in Parliament with Congress having a comfortable majority and whether it would join hands with BJP for floor coordination. He said the BJP was actually supportive of the nuclear deal and on many other issues, whether it was strategic relationship with USA or economic reforms. "It is very hard to distinguish between the two -- Congress and BJP. "But if they (BJP) are willing, for example, to say no to disinvestment, they will not allow financial sector reforms then yes... if they are willing to say this and take a position in the House. But somehow, I place this at a bare minimum," Mr. Yechury said. Though anti-Congressism may crop up in view of Congress party's plans for a grand revival in major states, Mr. Yechury ruled out working with BJP against the Congress in the long run. Mr. Yechury said after the elections, Prime Minister Manmohan Singh has "emerged taller", but he would wait for the President's Address to the joint sitting to get first indications of the path the government would take in its policies and programmes. "The crucial difference this time is in the absence of Left support, there is no Common Minimum Programme. And since there is no CMP, you don't know what is the policy direction they are going to adopt," the CPI(M) leader said. "The seeds of future contradictions in the UPA and the Congress have been sown," he said, adding that while there was an emphasis on the 'aam aadmi' by Rahul Gandhi and Sonia Gandhi, the Prime Minister stood for "neo-liberal reforms". "This is where the future contradictions will lie," he said pointing out that the Planning Commission and the Prime Minister had way back in 2006 spoken about full capital account convertibility. On industrialisation in Bengal, Mr. Yechury said Trinamool Congress had taken its opposition to the Left Front to "an absurd level" that it was even opposing central assistance to the state for relief to the cyclone victims. "The fact is the obstacles for industrialisation in Bengal that the Trinamool Congress has created so far, they are going to be intensified with them being in the Union Cabinet. And it has reached such an absurd level that media reports that Mamata has asked the Central Government not to give assistance to Bengal for cyclone damage."